Yesterday I spent the afternoon painting. First at Little Hawthorne finishing the guest room and then in the basement of the big house working on a chair we put up in the meadow once the snow goes away. There is a zen to painting. Therapeutic and relaxing all at the same time. The methodical strokes of the brush. One of the things I like most is seeing/accomplishing something right in front of your own eyes. To create a whole new look in a short amount of time. Painting is one of the easiest and most economical ways to create something anew. If you end up not totally liking the color, try another. The joy is in the doing. We head to Hawthorne on Sunday for a stay that has become our annual October trip to see the Fall colors. Caretaker Bill has been busy finishing up a bunch of tasks before we arrive. You might have noticed from prior post, that Bill is a gem. He takes care of our home as if it is his, and watches after it while we are away so expertly, for which we are forever grateful. 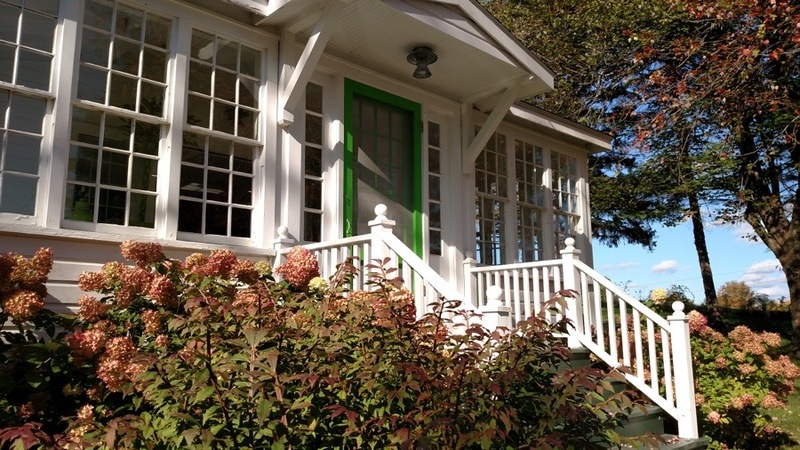 On our wish list has always been a green front door to tie in all the other green we used throughout the house. Yesterday was the day it was painted. Oh my word, so happy with the result I could squeal. OK, maybe I actually did. I think we both did. Thought you would all enjoy. 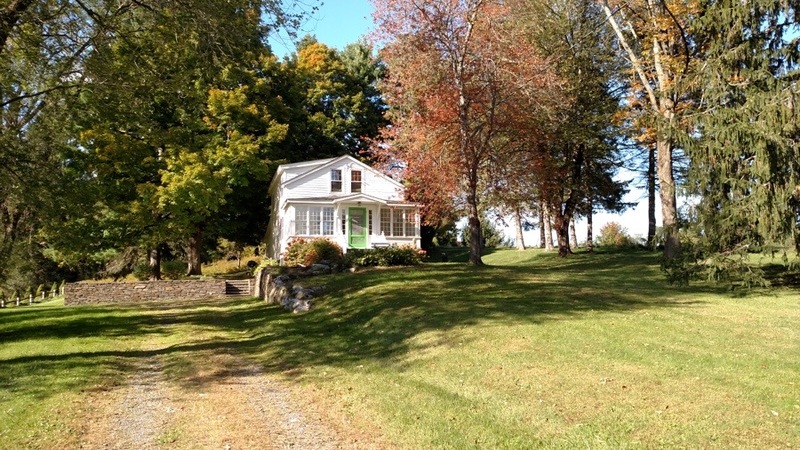 Lots of fun Hudson Valley posts in the coming weeks. It has been such a treat to be at the house this week. The Fall colors have been stupendous and the weather has just been lovely. 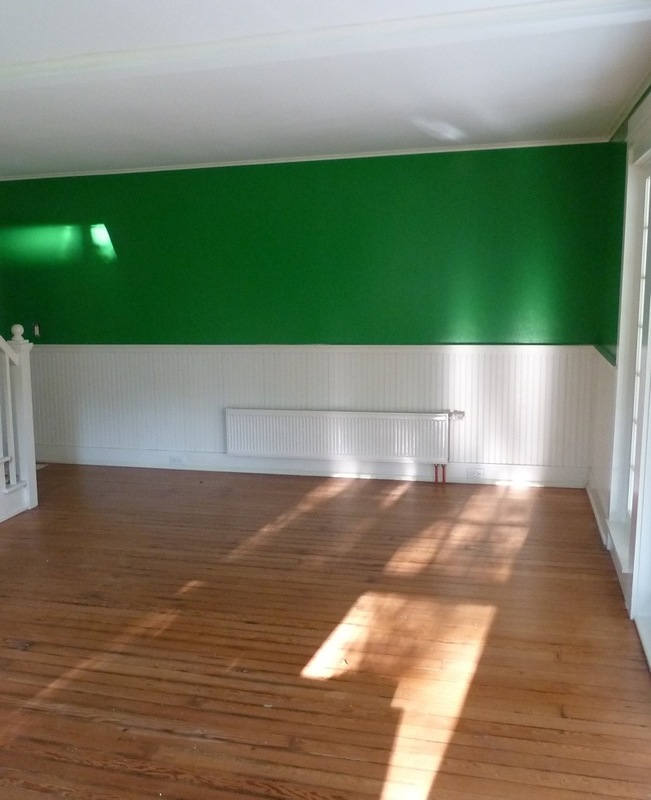 Many sunny days to have the light stream through all the windows highlighting all the shades of green. 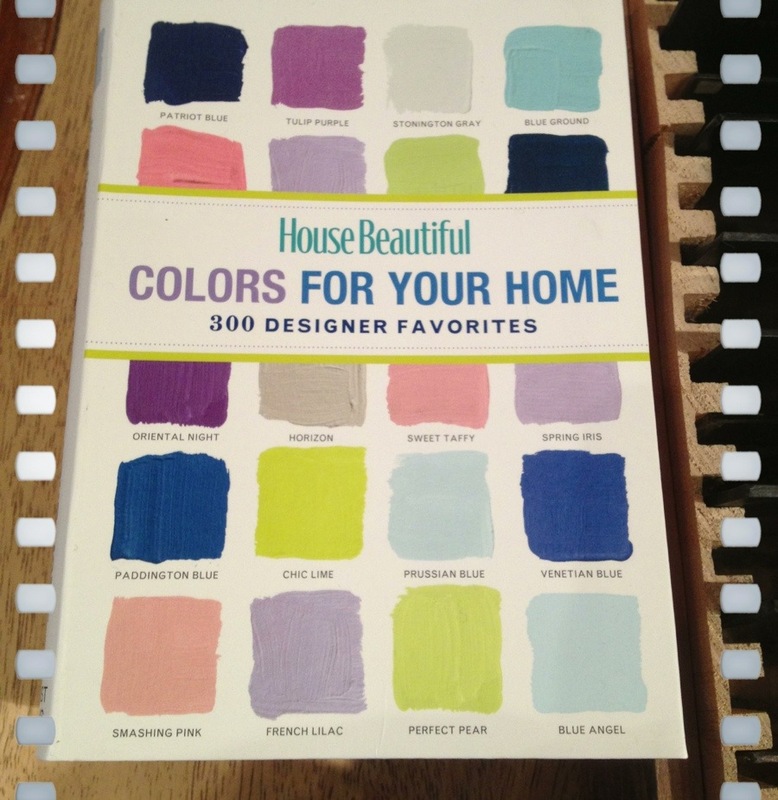 As promised, I wanted to write a post with all of the colors we chose, as many of you have sent me e-mails asking. 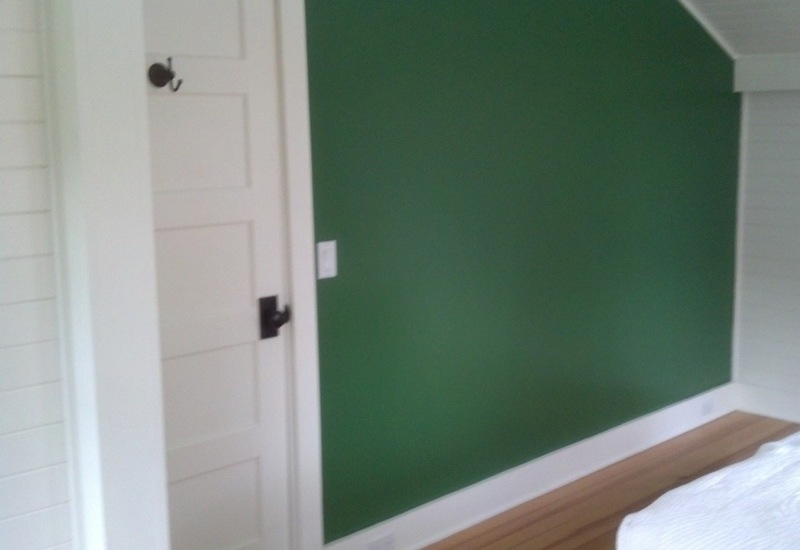 We chose Benjamin Moore Aura paint because we had heard from so many folks how much they had liked using it. We chose semi-gloss, as we like quite a bit of sheen. We like the way light bounces off of semi-gloss. It is also great because you can wipe it down if needed. It is just durable and tough. The Aura really brings out the rich hues of a color. The varying greens have a depth of richness to them. For the living room we chose Peppermint Leaf 2033-20. It is the second darkest color we went with of the four we used. The living room is right next to the front sunroom, which is all white. French doors open out onto the sunroom, and we really wanted a warm contrast, since we knew they would be open most of the time. 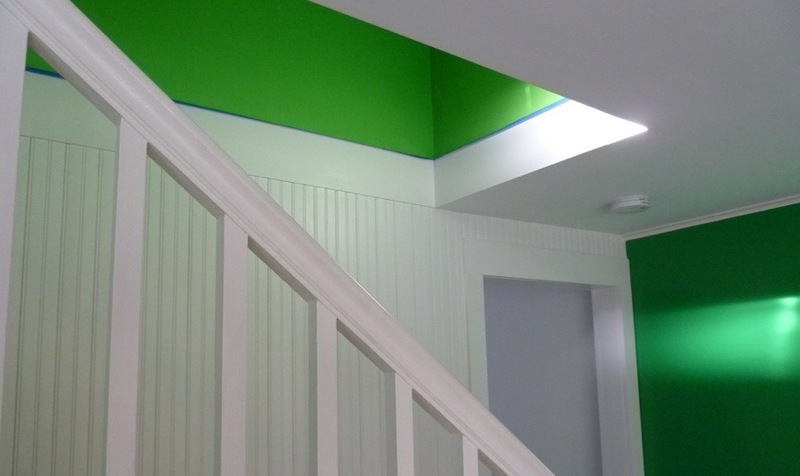 For the hallway leading upstairs, Sweet Pea 2031-30 was used. It is the brightest hue that was used. We really wanted it nice and bright and cheery. We got that in spades. 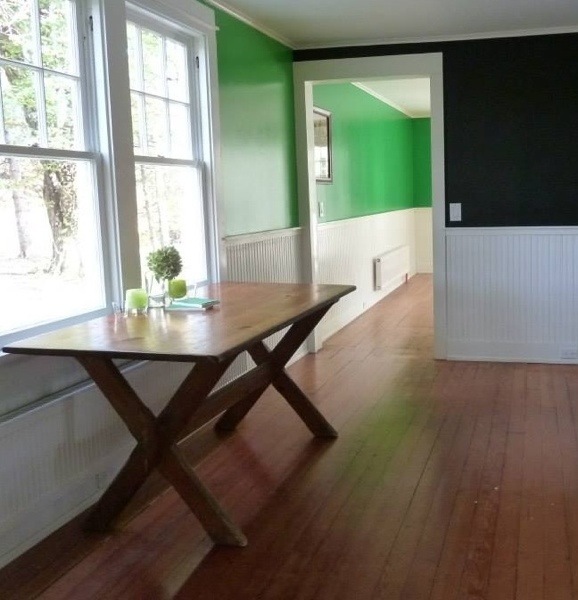 For the master bedroom we went with the darkest green of the lot. Glover Green 2034-10, was handsome and had the right amount of greeny richness we were going for. Having been here for the week, we chose right. It is soothing & relaxing. 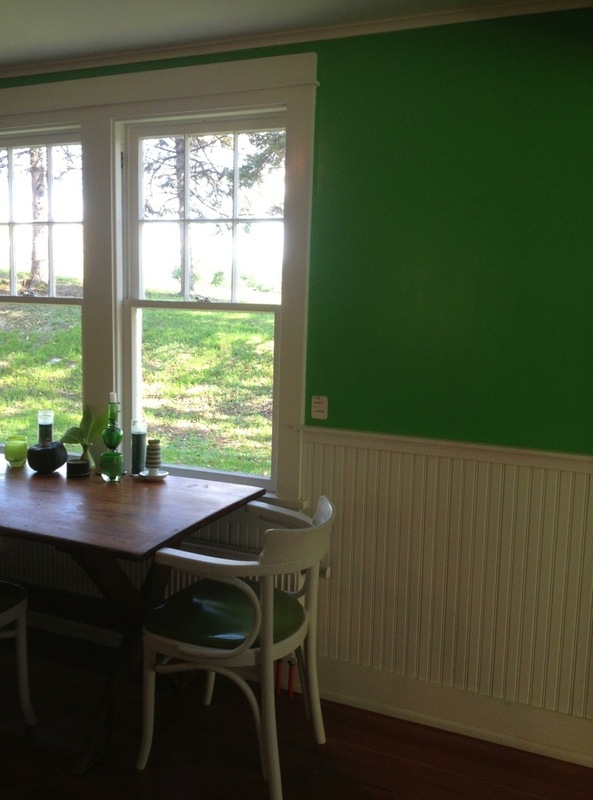 For the dining room, Fresh Lime 2032-30 was used. The close-up photo gives a bit better idea of the spunky shade. The room gets tons of light and looks out to the view of the valley. 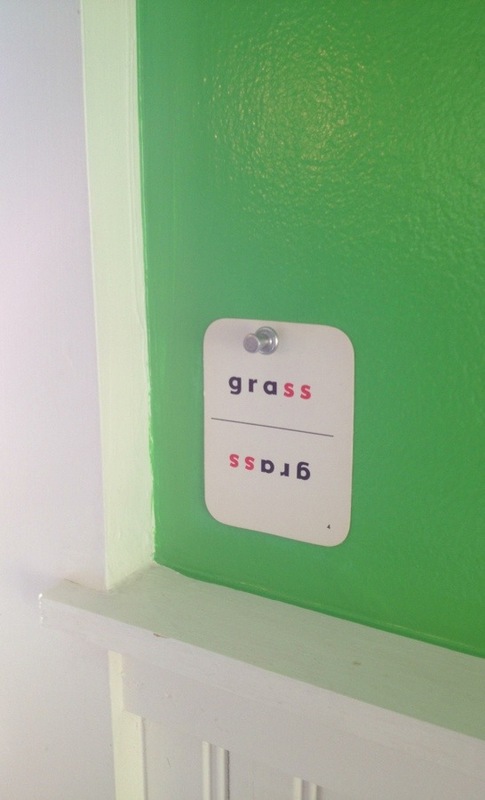 As well as the grass, hence the flashcard. 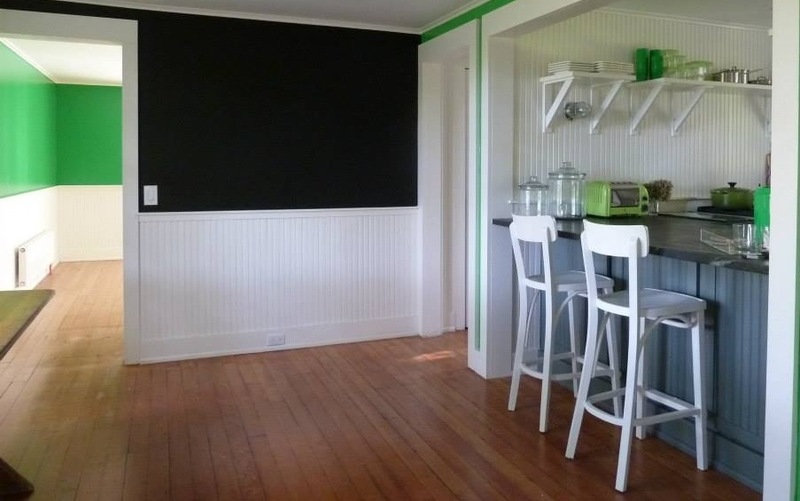 And lastly, the chalkboard painted wall in the dining room I wrote about a week or so ago. Seeing it now in person, we are even more thrilled. The black shade is beautiful mixed in with the greens. We could not be happier with how it all turned out! One of the things we were most excited about all the painting that was being done at Hawthorne, was getting the chance to use chalkboard paint. There was a wall in the dining room that would be a perfect size to try it out. Plus, we were told by many folks that aside from it being a usable chalkboard, the coloring and depth of the black shade was quite fetching. They were right. Black is an accent color we will use throughout the house, and the chalkboard wall just seems to ground the kitchen and dining area space. 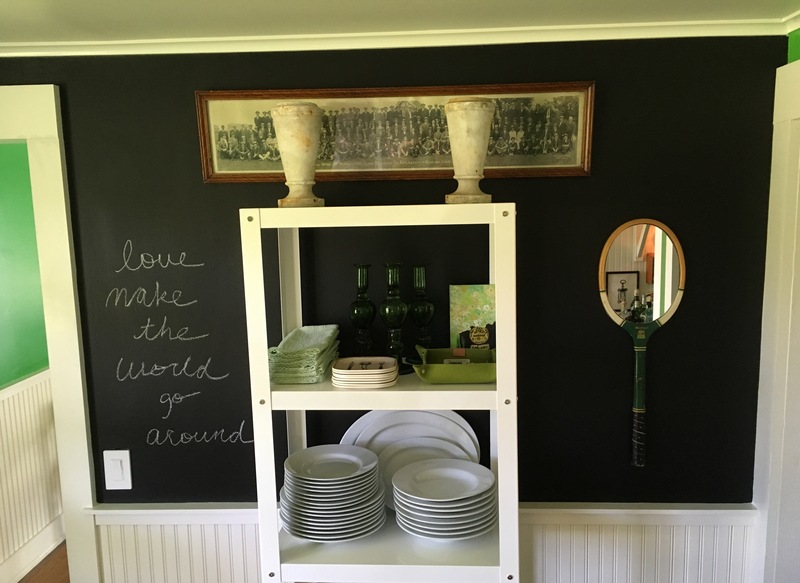 For more on chalkboard paint, check out this Benjamin Moore link to answer many questions about this very cool paint option. We leave next Sunday for New York, and we are getting incredibly excited to see all of the projects that have been completed since we were last a Hawthorne. Painting is almost complete and I could not wait to show you all. We decided on varying shades of green. It just felt right for the space. Plus it works nicely with all of the beautiful white that we so loved when we first saw the house. I think it is a good marriage of the 2 hues. 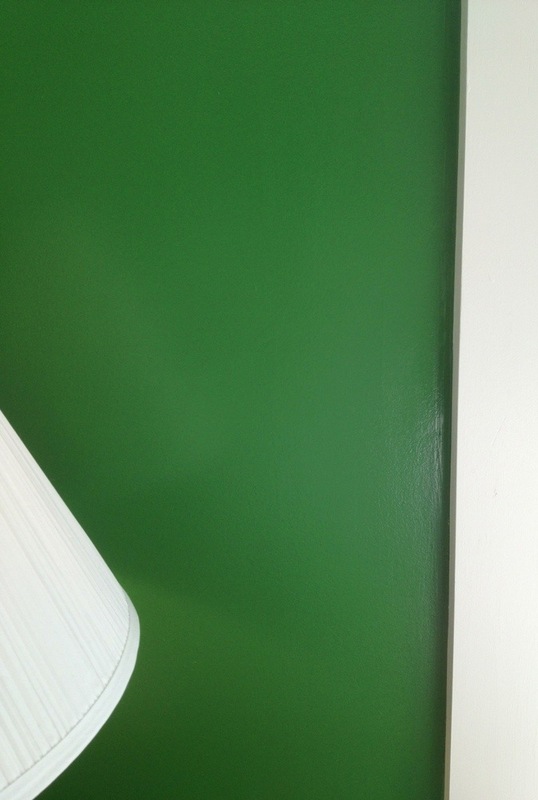 Benjamin Moore Aura semi-gloss was just the ticket to give a nice sheen to the walls. We love how the light plays off the semi-gloss. The care is quite easy too, as you can just gently wipe off marks. 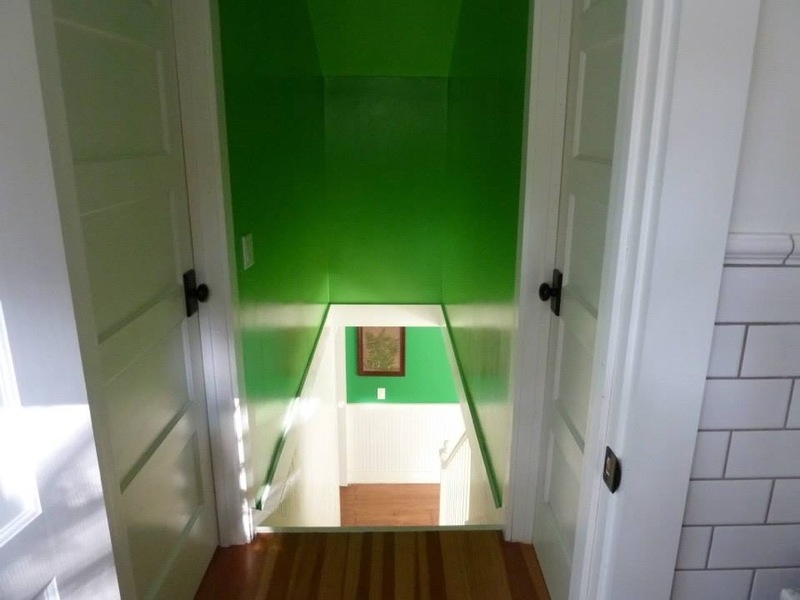 The hallway leading up or coming down from the bedrooms is a very happy green. The living room a warmer green to envelope you right as you come in. 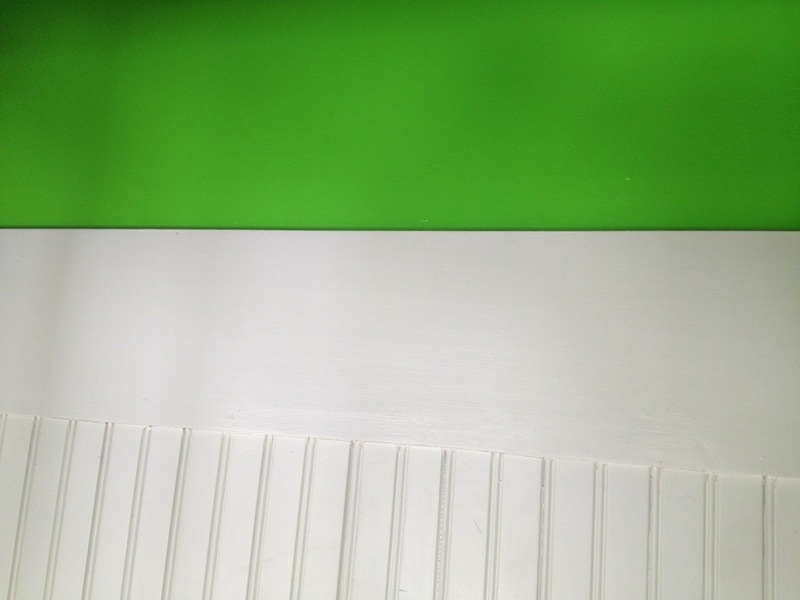 We are going to fill these walls with artwork, which I think this shade of green with work nicely with. The dining room a tad brighter than the living room. 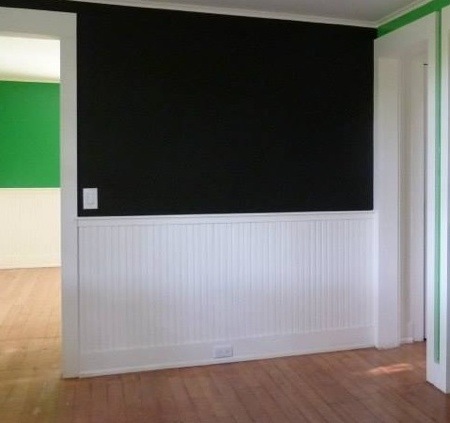 We had a wall painted with chalkboard paint. More on that tomorrow. 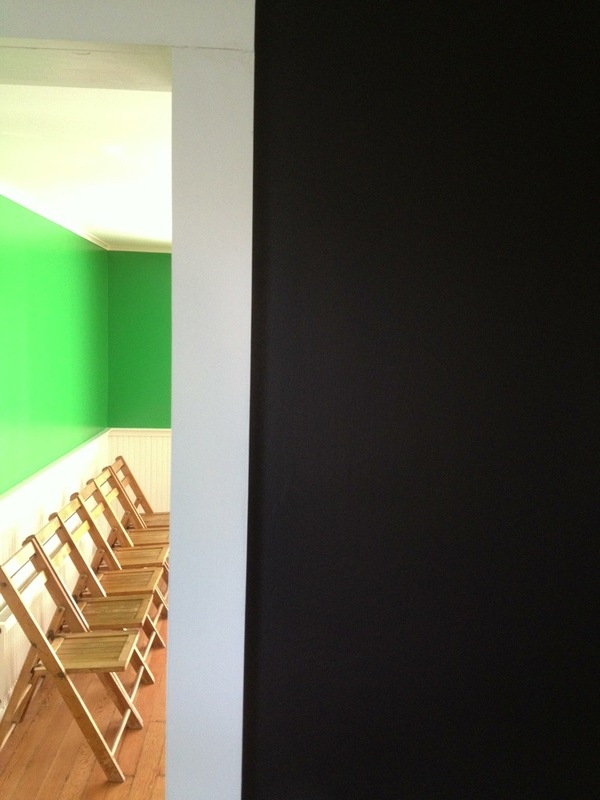 The vintage Thonet chair seats were pretty beat up, so we had them painted the same shade of green as the walls. A quick fix until we find a fabric we really like. 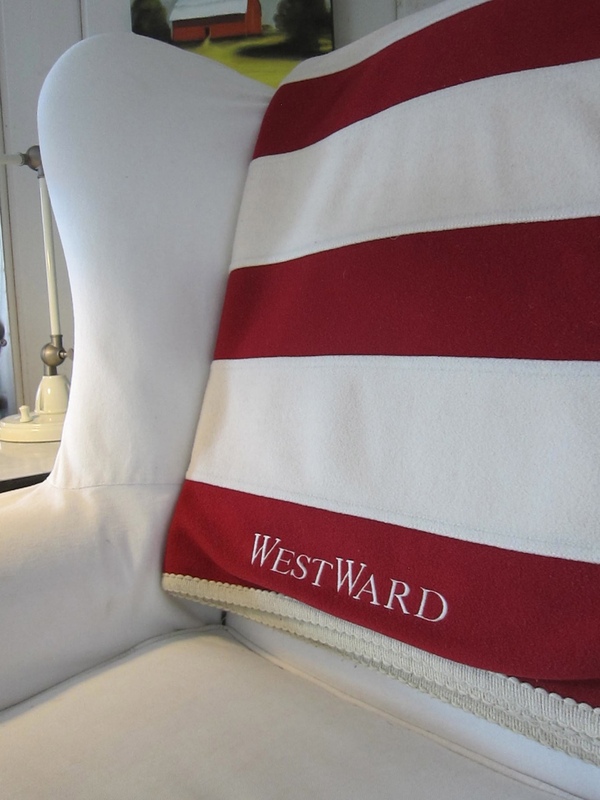 Red, White & Blue: The WestWard House Loves You! 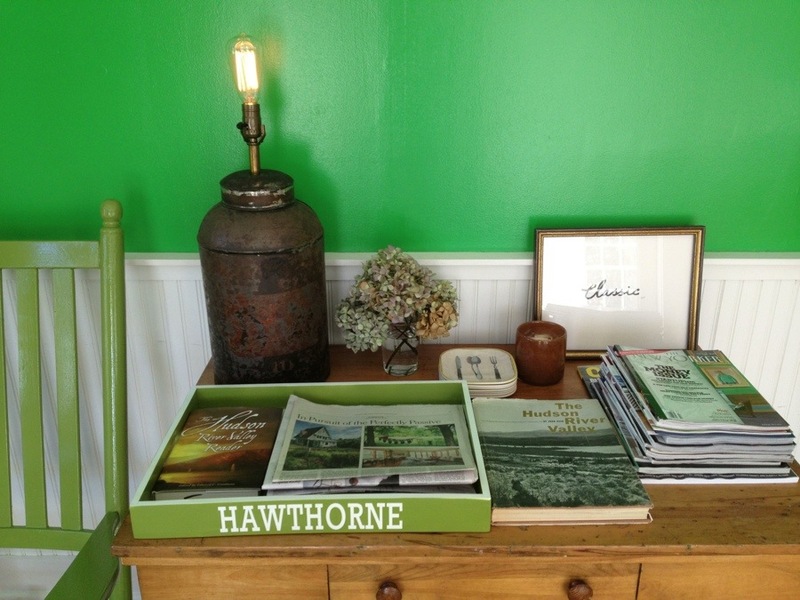 Our lovely and talented friend Jane Dagmi wrote and shot a really fun piece for the Benjamin Moore paint blog, www.colorchats.com about our beloved beach house, WestWard on Vashon Island. The timing for the post matching up perfectly with the 4th of July holiday. Just a bit of the back story. We bought the house and property from a former Seattle Mayor. The house was red, and next to the house sits a quite large flag pole. The design Gods had already made up their minds for us that this house would be done with a nod to Americana. We have had such a great time over the years finding–white vintage pottery, quilts and blankets, and ticking stripe materials to name a few. Jane and her daughters have been our guests on several visits when they make the trek from Florida. She produced and wrote the article on WestWard for Country Living magazine oh so many years ago, so she is quite familiar with the setting. Thanks Jane for another visually rich (in both word & photo) story! A happy 4th to all! I hope your day is filled with all good things. 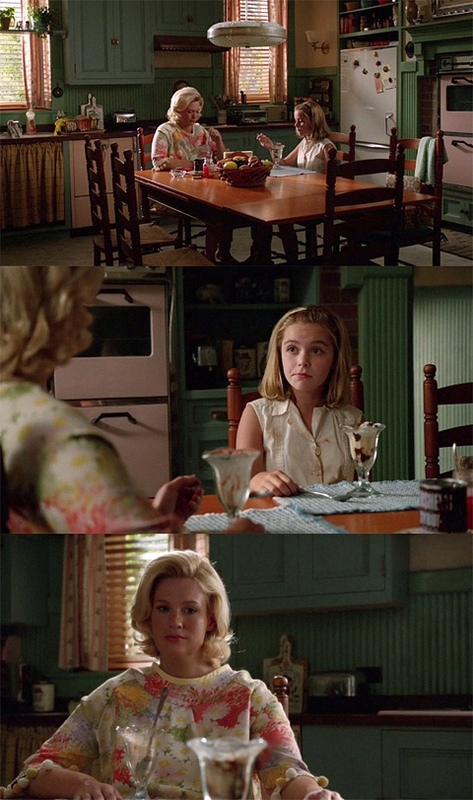 I was asked by design & style writer Jane Dagmi to describe my ‘make-over’ of a kitchen in the “Mad Men” television series for the Benjamin Moore paint blog, Color Chats. 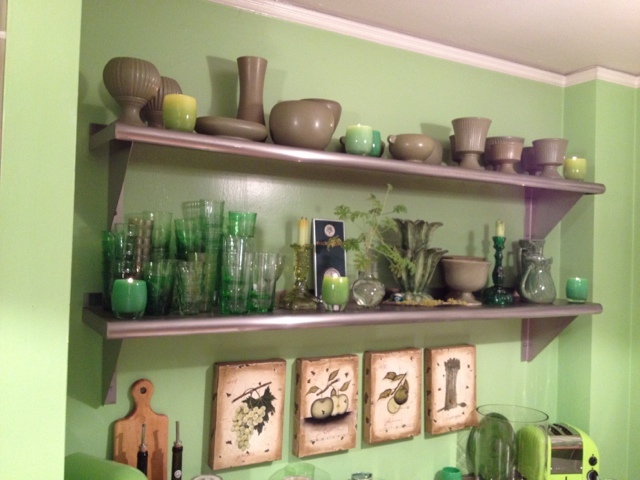 Jane knew I was a fan of an all-green kitchen, since she wrote about ours for Country Living magazine a few years back. She writes, “I asked 3 super stylish guys–all masters of visual merchandising–to discuss 3 super-styled Mad Men sets. 1. 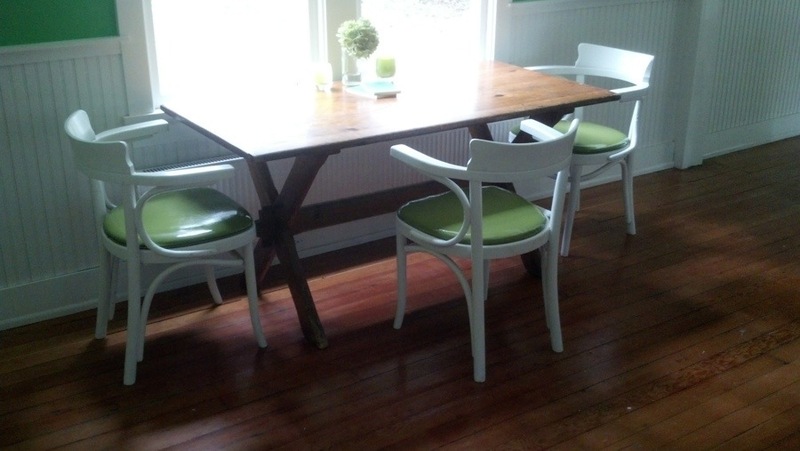 PAINT: Go high gloss with a product like Advance – paint the chairs and table each with a vibrant shade of green. 2. WINDOW TREATMENTS: Ditch the curtains; keep the shades. 3. APPLIANCES: Install a glass-fronted Sub-Zero fridge to open up the space. 4. LIGHTING: Replace pendant with a green beaded chandelier; take sconce shade off and go with an exposed Edison bulb. 5. 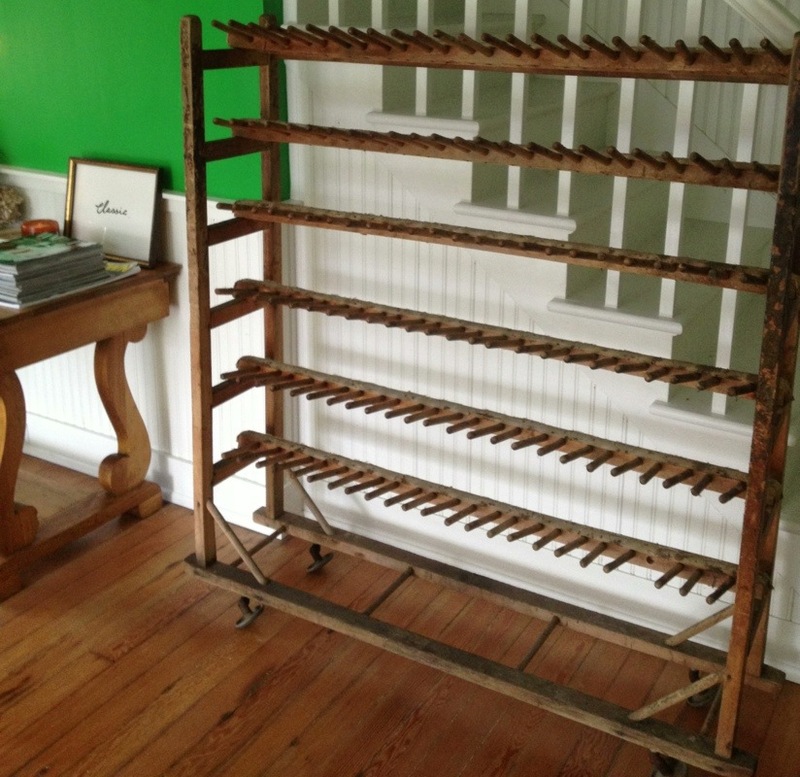 HARDWARE: Replace cabinet pulls with green glass vintage-inspired knobs. 6. SMALL ELECTRICS: Replace all counter top appliances with green-colored versions like a Dualit toaster and KitchenAid mixer. Check out the rest of the blog post at www.colorchats.com ‘Guys On Style: The Decor of Mad Men’ and see how the other 2 guys, Simon Doonan and Eddie Ross, made over different rooms from the series. If you are a fan of the show, check out the very witty www.tomandlorenzo.com blog for many insights. The above photo trio was taken from their site. Thanks Jane, for a fun assignment!